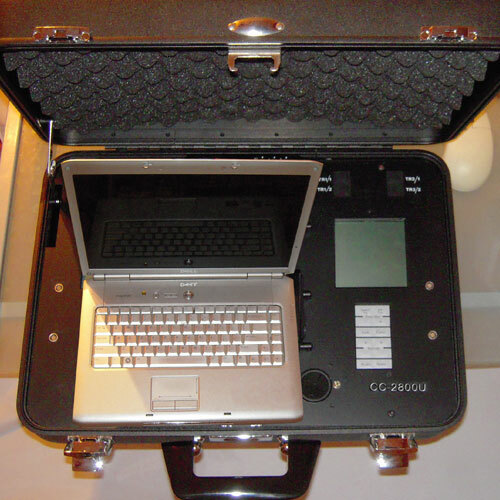 Because of the increase of UMTS cellular communication users, the Cellular Intercept CC2800U was developed. This mobile intercept feature is a 3G Intercept, able to work across the CC2800 series backbone, expanding the capability of COMINT achievement by keeping up with new cellular frequencies such as 3G. At the forefront of current cellular interception, the CC2800U employs a stealth feature in order to intercept communications without alerting the suspect. Less professional groups offering a 3G Intercept or UMTS Intercept use cellular jammers and cellular jamming with their to aid in the interception process. This Cellular Intercept does not use any brute force jamming that could expose a mobile intercept investigation. Through analytic processes, the CC2800U is able to change the operating parameters of the relationship between the mobile phones under investigation with the service provider without revealing noticeable clues to the would-be targets. Target Mode: To search, lock on, and monitor a Target based on previous intelligence such as the phone number, IMSI, or TMSI even while that Target is engaged in a communication. Random Mode: To monitor a single cell or multiple cells, intercepting dozens of calls simultaneously. Network Analysis: To evaluate the local cellular network, review its flow of cellular traffic, and recommend suggestions so the user will understand how to better use the system. SMS Interceptor: To capture incoming and outgoing text messages, in the languages they are broadcast on. Antenna Enhancements: Directional and Omni-Directional optional configurations for expanded range capabilities. Cellular Detection: Advanced sensitivity as an automated feature, helping the user when searching for suspects. For more information on the Cellular Intercept technology, Contact Us or Visit Us with your Government End User. Live Demonstrations are available at our factory or at your Government End User site. We also offer qualified inquires a comparison of our Cellular Intercept to competitor systems.